Since the vast majority of abortions in the United States are illegal, it is impossible to estimate the number exactly. Commonly given figures range from 200,000 to 1,200,000 a year, with many authorities tending to accept the larger figure. While many abortions were performed illegally, but by doctors, others were do-it-yourself situations — often resulting in death. Also under discussion at the conference? 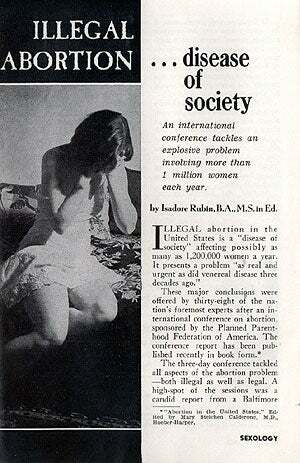 The psychological impact to the women who had abortions. Some doctors reported "disturbances" in patients, like guilt, resentment (toward a husband who insists on a woman having an abortion), loss of self-esteem, etc. But maybe that was because having an abortion in the U.S. was so complicated? A recent study in Norway found practically no psychological reactions following abortion. Of the group of women studied, only two showed any reaction to the abortion and their reaction was just a feeling of distress and embarrassment that lasted for a few weeks and disappeared. Dr. Kinsey, speaking as a biologist, expressed considerable disagreement with many of the conclusions drawn by the psychiatrists. We have no right to assume, he asserted, that the disturbances found in patients who had abortions were necessarily the result of the abortion. These same disturbances may have resulted from other situations as well. The experts at the conference also found that it was easier for a rich woman to have a legal abortion than a poor woman. (Imagine that!) A number of recommendations were proposed in the hopes of reducing dangerous illegal abortions: Psychological evaluations of patients; consultation centers, (modeled after the ones in Scandinavian countries); freely available birth control advice; and of course, a unified abortion law (instead of one that varied from state to state, city to city and even from hospital to hospital in the same city). Coincidentally, there is an obituary in the New York Times today for Lorraine Rothman, a feminist health movement leader in the '70s. Ms. Rothman, who was a schooteacher, developed a device called a menstrual extraction kit, which could be used for early abortions in the home, without the need for hospitalization. The kit, which was patented by Ms. Rothman in 1974 (The Supreme Court ruling on Roe v. Wade occurred in January of 1973), could also be used to remove menstrual blood and shorten a woman's period. Ms. Rothman was part of a group that advocated self-help medical procedures, because at the time, there were concerns about the availability of legal abortions in hospitals. She died last week at the age of 75. Related: Would "Seeing" An Actual Abortion Change Your Mind About It? Would "Seeing" An Actual Abortion Change Your Mind About It?